The Rush Way defines the core value of Empathy as a characteristic ‘that is at the core of solid relationships’. To understand the importance of this core value, the definition of the word itself is necessary. Empathy is the ability to understand and share the feelings of another. It is a characteristic that every staff member, coach and player at the Rush is expected to learn and embody. The Rush Core Value of Empathy is the core value highlight for the month of March. In the remaining days of the month, some quotes and stories from Northern California (Nor Cal) Rush staff and players will help bring this core value to life as it is embodied in the Rush Way culture at their club. "To me, empathy means to treat your players like you’d treat your family. This means talking to them not just about soccer, but about what’s going on in their lives. Some may be undergoing some challenging times that I would know nothing about unless they opened up. A few players identify me as their second father figure, and personally, I don’t mind that at all. In the end, it means listening attentively to the players’ specific concerns and suggestions. After all, I’m still a student of the game myself." “To me, empathy means showing compassion for your teammates during emotional moments of joy, grief, or disappointment during games. It can create an environment in which players feel a sense of belonging, especially when you make mistakes. "When I talk to a parent about what they see for their player beyond high school, I hear that most are without a direction, and feel overwhelmed and hopeless. The opportunity to be a student-athlete seems a very far reach for them. I emphasize with them as I was in the same place only a couple of years prior. I remind them I am here to offer information, resources, and direction. I'm available to devise a plan and give them guidance. We are united by soccer and we are their RUSH family." A resounding sense of family and community is fostered in these 3 perspectives shared about the core value of empathy. In essence, these coaches and players know that being part of Rush means something more than playing on a grass pitch where kids are organized to play a game they love on the weekends. In so many enriching ways, being part of Rush means living life alongside one another in trainings, games, and weekend tournaments. It means instilling a culture where teammates encourage one another, compete for one another, and lift each other up (no matter the outcome of their matches). It means coaches are invested in growing kids in the game, but more importantly in life, recognizing that life impacts their players’ on and off the pitch. Rush sees value in creating environments where players and parents feel a sense of family, where weekend matches become more than just a youth game but an opportunity to build relationships and a strong community season to season. 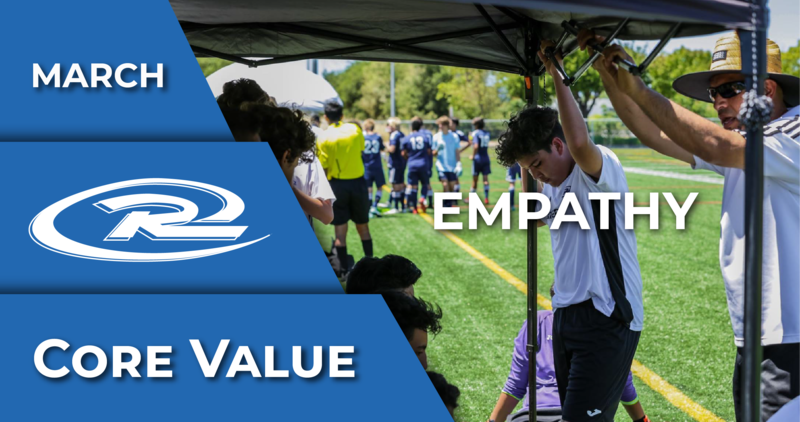 Empathy among coaches, players and parents impacts enjoyment and safety, two other core values (among several more) that Rush seeks to impart on the kids and families that embrace the Rush Way culture. The Core Value Highlight for April is Advice. In the coming weeks, Rush will share stories and experiences from across Rush Nation that have impacted coaches’ and players’ understanding of the importance of advice in the workplace and on the pitch.